The technique for generating high-intensity, ultra-short optical pulses developed by the 2018 Nobel Prize for Physics winners, Professor Gérard Mourou and Dr. Donna Strickland, provides the basis for important scientific approaches used in Swinburne's research. ARC Centre of Excellence for Future Low Energy Electronics Technologies (FLEET) Chief Investigator at Swinburne, Associate Professor Jeff Davis, uses laser pulses just a few quadrillionths of a second in duration to investigate novel, complex materials that could be used in future low-energy electronics. The field of study is ultrafast 'femtosecond' spectroscopy – a femtosecond is a millionth of a billionth of a second. "These extremely short-duration pulses are necessary to measure the evolution of sub-atomic particles such as electrons," explains Associate Professor Davis. "When you want to measure how fast something is moving, you need a starter's gun to set things going and something to stop the clock. "In a 100 metre race, this is straightforward because the time taken to run 100 metres is slow compared with how fast you can push the buttons on a stopwatch. "But when you want to measure the precise evolution of electrons, which can change their properties or their state in femtoseconds, you need to be able to start and stop the clock much, much faster. We use femtosecond laser pulses to achieve this." 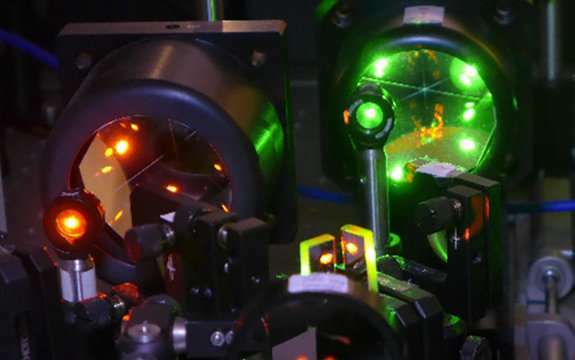 Swinburne has the highest concentration of ultrafast laser systems in the southern hemisphere, many relying on the technique developed by Dr. Strickland and Professor Mourou. In fact, Swinburne was the first lab in Australia to install one of these amplified laser systems, in 1998, to provide a fundamental understanding of novel materials. The development of chirped-pulse amplification (CPA) by Professor Mourou and Dr. Strickland has enabled scientific discoveries in a number of fields. CPA allows high-energy pulses to be produced every microsecond – a million pulses per second – which means that spectroscopy measurements can be performed in a reasonable time, allowing sufficient data to be acquired to minimise noise levels on weak signals. This also makes it possible to vary different control parameters to build up a comprehensive picture of the important factors affecting the dynamics and mechanisms of the specific process of interest. The extremely high energy of the laser pulse ensures that nonlinear processes are efficient. This allows researchers to 'tune' the wavelength, producing laser light across the electromagnetic spectrum, from far infrared, through visible light, ultraviolet and even X-rays. As well as probing novel and complex materials, these high-energy, ultrashort laser pulses can be used to control the properties of these materials, and even drive them to change state, becoming novel quantum states of matter. "In FLEET, we are developing ways to change two-dimensional materials from being trivial insulators into what are known as topological insulators, and back again," explains Associate Professor Davis. Topological insulators are a relatively new state of matter, recognised by the 2016 Nobel Prize in Physics, that don't conduct electricity through their interior, but rather the electrical current can flow around the edges without resistance, and hence without energy loss. "Ultrafast laser pulses allows exquisite control over the properties of the material, giving us the potential for ultrafast switching," says Associate Professor Davis. "This exquisite control and our ultrafast measurement of dynamics will allow us to fully understand these phase transitions, allowing us to optimise their control in future devices. "So, it's fundamental science, but with an immediate application," explains Associate Professor Davis. "These experiments enhance our fundamental understanding of topological phase transitions, and we use this knowledge in our investigations of future ultra-low energy, topologically-based electronics."